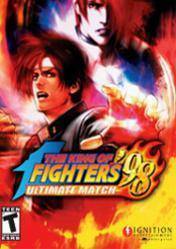 Compare and find the best prices for the cd key of The King of Fighters 98 Ultimate Match Final Edition for Steam. The digital codes or cd keys are the most convenient way to get your favorite games without leaving home. The digital game´s code must be add to your account in the corresponding download platform. In this case, The King of Fighters 98 Ultimate Match Final Edition can be downloaded directly from the Steam platform, introducing the cd key that you will receive via email after purchasing the The King of Fighters 98 Ultimate Match Final Edition cd key in any of the following stores. Stores that are shown in the following comparison of The King of Fighters 98 Ultimate Match Final Edition in digital format, have been and are regularly checked by our team, we guarantee they are 100% reliable. Also, you will see an assessment of the same based on feedback and experiences of our users to help you decide where to buy your cd key of The King of Fighters 98 Ultimate Match Final Edition of the simplest, quickest and easiest way.